Buckle up and explore the outer reaches of reality on this vortex 12D motion theater experience in Queenstown! 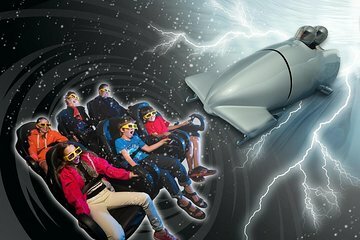 Step inside your own personal motion theater and choose from over 80 different movie scenarios including jet-pack rides, roller coasters, alien battles and dinosaur races. With each ride combining up to 12 different features including snow, wind, rain and even bubbles, it almost feels real! Transport yourself into magical worlds where fantastic surprises await round every corner, and enjoy an out-of-this-world adventure suitable for all ages in Queenstown, New Zealand.